The gilded bier from the base of Tutankhamun's Sarcophagus. 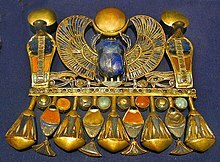 A pectoral belonging to Tutankhamun, representing his Prenomen. The artifacts had sparked widespread interest in ancient Egypt when they were discovered between 1922 and 1927, but most of them remained in the Egyptian Museum in Cairo until the 1960s, when they were first exhibited outside of Egypt. Because of these exhibitions, relics from the tomb of Tutankhamun are among the most travelled artifacts in the world. Probably the best-known tour was the Treasures of Tutankhamun from 1972 until 1981. Other exhibitions have included Tutankhamun Treasures in 1961 and 1967, Tutankhamen: The Golden Hereafter beginning in 2004, Tutankhamun and the Golden Age of the Pharaohs beginning in 2005, and Tutankhamun: The Golden King and the Great Pharaohs in 2008. Permanent exhibitions include the Tutankhamun Exhibition in Dorchester, United Kingdom, which contains replicas of many artifacts. One of the golden shrines, now on display in the Egyptian Museum. All of the artifacts exhumed from the Tutankhamun tomb are, by international convention, considered property of the Egyptian government. Consequently, these pieces are normally kept at the Egyptian Museum in Cairo; the only way for them to be shown internationally is by approval of Egyptian authorities. Although journalists and government officials generally support the tours, some Egyptians argue that the artifacts should remain on display in their own country, where Egyptian school-children would have greater access to them, and where the museum's exhibit would attract foreign tourists. The first travelling exhibition of a substantial number of Tutankhamun artifacts took place from 1961 to 1966. The exhibition, titled Tutankhamun Treasures, initially featured 34 smaller pieces made of gold, alabaster, glass, and similar materials. The portions of the exhibition occurring in the United States were arranged by the Smithsonian Institution and organized by Dr. Froelich Rainey, Director of the University of Pennsylvania Museum of Archaeology and Anthropology, with the assistance of Dr. Sarwat Okasha, Minister of Culture and National Guidance of the United Arab Republic. The exhibit travelled to 18 cities in the United States and six in Canada. The exhibition had a public purpose in mind, to "stimulate public interest in the UNESCO-sponsored salvage program for Nubian monuments threatened by the Aswan Dam project". The exhibition opened in November 1961 at the Smithsonian's National Gallery of Art, in Washington, D.C.
From 1965 to 1966 an enlarged version of the 1961–1963 North America tour took place in Japan. The Japanese exhibition saw nearly 3 million visitors. The iconic burial mask of Tutankhamun was among the most popular pieces in the Treasures of Tutankhamun exhibition. The genesis of the Treasures of Tutankhamun exhibition reflected the changing dynamic of Middle-East relations. It was first shown in London at the British Museum in 1972. After a year of negotiations between Egypt and the United Kingdom, an agreement was signed in July 1971. Altogether, 50 pieces were chosen by the directors of the British Museum and the Cairo Museum to be shown at the exhibition, including 17 never before displayed outside Egypt. For insurance purposes, the items were valued at £9.06 million. In January 1972, they were transported to London on two civilian flights and one by the Royal Air Force, carrying, among other objects, the gold death mask of Tutankhamun. Queen Elizabeth II officially opened the exhibition on March 29, 1972. More than 30,000 people visited in its first week. By September, 800,000 had been to the exhibition, and its duration was extended by three months because of the popularity. When it did close on December 31, 1972, 1.6 million visitors had passed through the exhibition doors. All profits (£600,000) were donated to UNESCO for conserving the temples at Philae, Egypt. Treasures of Tutankhamun was the most popular exhibition in the museum's history. It is considered a landmark achievement in Egypt–United Kingdom relations. The exhibition moved on to other countries, including the USSR, US, Canada, and West Germany. Egyptian cultural officials initially stalled prospects of an American tour, as Egypt was then more closely aligned with the Soviet Union, where fifty pieces had toured in 1973. However, relations thawed later that year when the U.S. interceded on Egypt's behalf to prevent the total destruction of Egypt's Third Army during a military conflict with Israel. U.S. president Richard Nixon thereafter visited Egypt, becoming the first American President to do so since the Second World War, and personally prevailed upon Egyptian president Anwar Sadat to permit the artifacts to tour the United States – with the U.S. tour including one more city than the Soviet tour had included, and several additional pieces. The showing was the largest of Tutankhamun's artifacts, with 53 pieces. The Metropolitan Museum of Art organized the U.S. exhibition, which ran from November 17, 1976, through September 30, 1979. More than eight million attended. The Metropolitan's exhibition was designed to recreate for visitors the drama of the 1922 discovery of the treasure-filled tomb. Included along with original objects excavated from the tomb were reprints from glass plate negatives in the Metropolitan’s collection of the expedition photographer Harry Burton's photographs documenting the excavation's discoveries step by step. The Smithsonian described the exhibit as one of the initial "blockbuster exhibits" which sparked the museum community's interest in such exhibitions. After the six U.S. tour locations were named, San Francisco citizens bombarded the Mayor's Office with inquiries as to why the tour was not coming there. As a result, museum trustees flew to Egypt to meet with the Egyptian Museum in Cairo, where they worked out a mutual agreement for a seventh stop. Profits after exhibition expenses resulted in $10+ million going to the Egyptian Museum for refurbishing. After the exhibition left London in 1972, it toured the USSR from 1973–1975. While the exhibition was on display in San Francisco, Police Lieutenant George E. LaBrash suffered a minor stroke as he guarded the treasures after hours. He later filed a lawsuit against the city on the theory that his injury had resulted from the legendary curse of the pharaohs. Originally entitled Tutankhamen: The Golden Hereafter, this exhibition is made up of fifty artifacts from Tutenkhamun's tomb as well as seventy funerary goods from other 18th Dynasty tombs. The tour of the exhibition began in 2004 in Basel, Switzerland and went to Bonn, Germany on the second leg. The European tour was organized by the Art and Exhibition Hall of the Federal Republic of Germany, the Supreme Council of Antiquities (SCA), and the Egyptian Museum in cooperation with the Antikenmuseum Basel and Sammlung Ludwig. Deutsche Telekom sponsored the Bonn exhibition. Tutankhamun and the Golden Age of the Pharaohs consists of the same items from the Germany and Switzerland tour but in a slightly different exhibition. Of the 50 artifacts from the Tutankhamun tomb fewer than ten were repeated from the 1970s exhibition. This exhibition began in 2005, and was directed by Egypt's Supreme Council of Antiquities, together with Arts and Exhibitions International and the National Geographic Society. From November 15, 2007, to August 31, 2008, the exhibition was shown in The O2, London. It then stayed for eight months in Dallas, Texas, at the Dallas Museum of Art (October 2008 – May 2009), and for nine months at the De Young Museum in San Francisco from June 27, 2009 to March 28, 2010. From April 23, 2010, to January 11, 2011, the exhibition was shown at the Discovery Times Square Exposition in New York City. In 2011 the exhibition visited Australia for the first time, opening at the Melbourne Museum in April for its only Australian stop where it achieved the highest touring exhibition box office numbers in the country's history before Egypt's treasures return to Cairo in December 2011. Tutankhamun and the Golden Age of the Pharaohs displays actual items excavated from tombs of ancient Egyptian Pharaohs. From 130 authentic artifacts presented, 50 were found specifically during the excavations of Tutankhamun's tomb. The exhibition includes 80 exhibits from the reigns of Tutankhamun's immediate predecessors in the Eighteenth dynasty, such as Hatshepsut, whose trade policies greatly increased the wealth of that dynasty and enabled the lavish wealth of Tutankhamun's burial artifacts. Other items were taken from other royal graves of the 18th Dynasty (dating 1555 BCE to 1305 BCE) spanning Pharaohs Amenhotep II, Amenhotep III and Thutmose IV, among others. Items from the largely intact tomb of Yuya and Tjuyu (King Tut's great-grandparents; the parents of Tiye who was the Great Royal Wife of the Egyptian pharaoh Amenhotep III) are also included. Yuya and Tjuyu's tomb was one of the most celebrated historical finds in the Valley of the Kings until Howard Carter's discovery in 1922. This exhibition does not include either the gold death mask that was a popular exhibit from The Treasures of Tutankhamun exhibition, or the mummy itself. The Egyptian Government has determined that these artifacts are too fragile to withstand travel, and thus they will permanently remain in Egypt. The mummy of Tutankhamun is the only known mummy in the Valley Of The Kings to still lie in its original tomb, KV62. Tutankhamun and the Golden Age of the Pharaohs was expected to draw more than three million people. The exhibition started in Los Angeles, California, then moved to Fort Lauderdale, Florida, Chicago and Philadelphia. The exhibition then moved to London before finally returning to Egypt in August 2008. Subsequent events have propelled an encore of the exhibition in the United States, beginning with the Dallas Museum of Art in October 2008 which hosted the exhibition until May 2009. The tour continued to other U.S. cities. After Dallas the exhibition moved to the de Young Museum in San Francisco, to be followed by the Discovery Times Square Exposition in New York City. This exhibition features over 150 authentic tomb objects, with many appearing outside of Egypt for the first and last time time. Running from March 2018 to May 2020 touring America, France and England. A new permanent exhibition for the treasures is being constructed at the Grand Egyptian Museum in Cairo so this is the last time the contents of the tomb will be displayed outside of Egypt. Several exhibitions have been established which feature replicas of Tutankhamun artifacts, rather than real artifacts from archaeological sites. These provide access to pieces of comparable appearance to viewers living in places where the real artifacts have not circulated. The first replica exhibition, a copy of the entire tomb of Tutankhamun, was built only a few years after the discovery of the tomb. This replica was temporary, staged by Arthur Weigall for the British Empire Exhibition at Wembley, in 1924. Modern replica exhibitions exist in Dorchester, Dorset, England, in Las Vegas, Nevada, United States, and even in Cairo, Egypt (where the replica exhibition is intended to reduce the overwhelming traffic to the real locations). A travelling exhibition of replicas titled Tutankhamun: His Tomb and Treasures, featuring several hundred pieces, has been shown in Zürich, Brno, Munich, and Barcelona. The Tutankhamun Exhibition in Dorchester, Dorset, England, is a permanent exhibition set up in 1986 by Michael Ridley as a re-creation of the tomb of the ancient Egyptian Pharaoh Tutankhamun. The exhibition does not display any of the actual treasures of Tutankhamun, but all artifacts are recreated to be exact facsimiles of the actual items. Original materials have been used where possible, including gold. The story line is based around the famous English archaeologist Howard Carter. The Exhibition reveals history from Carter's point of view as he entered the tomb in Valley of the Kings in November 1922. The entry section of the Exhibition displays general information about Tutankhamun's life and death. Tutankhamun's mummy. A life-size model of the mummy is displayed. The exhibitors claim that it took more than two years to recreate the mummy. X-ray pictures taken from the real mummy helped to make an exact copy. The ante-chamber contains replicas of furniture and Tutankhamun's personal items he had been buried with. The burial chamber exhibits replicas of the sarcophagus and coffin of Tutankhamun. The Treasure Hall shows recreations of statues and jewels found within the tomb of Tutankhamun. Sitting statue of Anubis, the Golden Throne, Gold Death Mask and statue of guardian goddess Selkit are displayed among other items. The Discovering Tutankhamun exhibition at the Ashmolean Museum in Oxford, England, was a temporary exhibition, open from July until November 2014, exploring Howard Carter’s excavation of the tomb of Tutankhamun in 1922. Original records, drawings and photographs from the Griffith Institute are on display. The complete records of the ten year excavation of the tomb of Tutankhamun were deposited in the Griffith Institute Archive at the University of Oxford shortly after Carter's death. A replica death mask was displayed along with replicas of other items from the tomb. ^ a b c d Melani McAlister, Epic Encounters: Culture, Media, and U.S. Interests in the Middle East Since 1945 (2005), p. 127. ^ Zahi A. Hawass, The Golden Age of Tutankhamun: Divine Might and Splendor in the New Kingdom (2004), p. 130. ^ a b c d e f g h i Malek, Jaromir (January 31, 2009). "Some thoughts inspired by a current exhibition:'Tutankhamun: His Tomb and Treasures'". Brno, Czech Rep.
^ a b c d "Tutankhamun Treasures", Art international: Volume 6 (1962), p. 51. ^ a b Institute of International Education, Overseas: Volume 1 (1961), p. 31. ^ a b c d e f Smithsonian Institution, Tutankhamun Treasures: A Loan Exhibition from the Department of Antiquities of the United Arab Republic (1961). ^ a b Midwest Museums Conference, Midwest Museums Quarterly: Volumes 21–28 (1961), p.34. ^ "Golden glints from the past". The Globe and Mail. Toronto ON. October 31, 1964. p. 15. ^ "Treasures of Tutankhamun". The British Museum. Retrieved April 22, 2013. ^ Peter Green, Classical Bearings: Interpreting Ancient History and Culture (1998), p. 77. ^ Finding aid for the Irvine MacManus records related to "Treasures of Tutankhamun" exhibition, 1975-1979 in the Metropolitan Museum of Art Archives. ^ a b "Audience Building: Marketing Art Museums" (PDF). Smithsonian Institution. October 2001. ^ "Tut Lecture Set". The Spokesman Review. March 24, 1978. ^ "Chatter", People Magazine, Vol. 17, No. 4 (February 1, 1982). ^ "Under Tut's spell". Al-Ahram Weekly. Retrieved July 18, 2009. ^ a b "King Tut exhibition. Tutankhamun & the Golden Age of the Pharaohs. Treasures from the Valley of the Kings". Arts and Exhibitions International. Retrieved August 5, 2006. ^ "Tutankhamun and the Golden Age of the Pharaohs". Kingtutmelbourne.com.au. Retrieved March 15, 2011. ^ "Melbourne Museum: Tutankhamun". Museumvictoria.com.au. Retrieved March 15, 2011. ^ "Tutankhamun exhibition smashes box office record". ABC News. Retrieved December 6, 2011. ^ Jenny Booth (January 6, 2005). "CT scan may solve Tutankhamun death riddle". The Times. UK. ^ "Dallas Museum of Art Website". Dallasmuseumofart.org. Retrieved July 18, 2009. ^ "Tutankhamun and the Golden Age of the Pharaohs, King Tut Returns to San Francisco, June 27, 2009 – March 28, 2010". Famsf.org. Archived from the original on January 20, 2009. Retrieved July 18, 2009. ^ "Tutankhamun: The Golden King and the Great Pharaohs". kingtut.org. Retrieved March 10, 2012. ^ "King Tut: Treasures of the Golden Pharaoh". kingtutexhibition.com. Retrieved March 6, 2019. ^ "Toutânkhamon, le Trésor du Pharaon". expo-toutankhamon.fr. Retrieved March 6, 2019. ^ "Tutankhamun: Treasures of the Golden Pharaoh". tutankhamun-london.com. Retrieved March 6, 2019. ^ "Sydney to host largest Tutankhamun exhibition to ever leave Egypt". smh.com.au. Retrieved March 11, 2019. ^ "Ashmolean Museum". Ashmolean website. Retrieved July 21, 2014. ^ "Griffith Institute Archive". Griffith Institute Archive. Retrieved July 21, 2014. A digital display of Tutankhamun primary sources and artifacts at the Griffith Institute at Oxford University. This page was last edited on 28 March 2019, at 12:23 (UTC).